In one of the Interlude chapters in the novel Aftermath: Life Debt, author Chuck Wendig takes the reader back to Maz Kanata’s castle on the verdant world of Takodana. While Kanata and her castle/world have appeared in a spattering of stories since she was first introduced in The Force Awakens, she has otherwise not received greater treatment in the Star Wars canon. Her unmistakable absence has left me disappointed since what we learn about Kanata and her connection to the Force in The Force Awakens is incredibly fascinating. Still, I know that her story will eventually receive a much larger treatment – I shared my own idea for a story that would suite her in a previous post– and in the meantime smaller stories like the Interlude in Life Debt satisfy my need to know more about her. The cover of Life Debt. What is so strange about this comment, what made me immediately stop reading the novel and left me in deep contemplation, is the phrase “Something is off balance.” Given that she follows this by saying there is “some stirring in the Force,” it is obvious that Kanata is referring to the Force being off balance. But what makes this so odd is the timing of her statement, coming only a handful of months after Anakin Skywalker – redeemed by his son Luke – fulfilled his prophetic destiny as the one who would bring balance to the Force. The entire trajectory of Anakin’s life, guided at times by the Force and at other times by his own feelings and actions, led him to that moment aboard Death Star II where the balancing act would finally be completed. It was not the first action towards fulfilling the prophecy, but it was, so far as Star Wars lore is concerned, the last. Kanata sits at a table in her castle. Basically, I think the simplest explanation is the one that probably makes the most sense: Kanata’s senses are correct, the Force feels off balance to her because it is off balance, a result of whatever is “stirring” within the mystical energy field. But beyond Kanata telling the truth, we really cannot extrapolate a great deal, there is just not enough information to help us understand the relationship between Anakin’s balancing act and the Force being off balance once again. While we cannot understand that relationship we can, however, acknowledge that if Kanata is correct then Anakin being the Chosen One and balancing the Force is called into question. Is it possible, we must ask, that Anakin did not actually balance the Force in Return of the Jedi? Or, if he truly did balance the Force, what could have caused the Force to be off balance right after he had fulfilled his prophetic destiny? And on this point, are we as fans okay with this new imbalance to the Force knowing that it runs the risk of undermining the fundamental lore at the very heart of the six Star Wars films George Lucas created? Or, is there potential for this new imbalance to add to that lore in a way that honors and expands, but does not detract from, Lucas’ original vision and story? It’s a Star Wars question so common that I rarely think about it: since Obi-Wan uses his lightsaber to cut off Ponda Baba’s arm in the Mos Eisley Cantina, why does the arm bleed? A fair question to be sure – technically, there shouldn’t be any blood because the wound should be cauterized when the blade goes through the arm. When others are dismembered by lightsabers, like Luke in The Empire Strikes Back or Zam Wesell in Attack of the Clones, their wounds are cauterized, there is no blood. But Ponda Baba is the exception, his wound is a bloody mess and I haven’t the slightest clue how to explain it. Perhaps Ponda Baba’s race, the Aqualish, are incapable of being burned and only bleed when wounded? Or maybe Obi-Wan cut the arm at just the right angle to open an artery but not cauterize it? Frankly, your guess is as good as mine. Why does Kenobi dismember Ponda Baba and kill Baba’s partner, Dr. Evazan? This is a question I have wrestled with for some time, with the starting point to answering it always being the most obvious explanation: Kenobi is simply acting in self-defense. Ponda Baba argues with Luke while Dr. Evazan (background) looks on. Initially, Luke is the one who is threatened by Evazan and Baba, and when Kenobi intervenes to calm the situation, the two nefarious individuals become rather violent. Kenobi ignites his lightsaber and, rather quickly, puts an end to the scuffle. The deed finished, the bloody arm lying on the ground and the groans of pain being heard, Kenobi stands resolute with his blade upright. And, just as quickly as the incident began, the scene moves along and we are introduced to Chewbacca and Han Solo. Now, first and foremost, I certainly think Obi-Wan is allowed to defend himself and Luke. But the issue I’m raising in the question is not whether Kenobi can act or should in self-defense, but how he acts in self-defense. To me, the issue of the bleeding arm is a distraction from the real issue inherent in the incident – the fact that one of the last remaining Jedi, a Jedi Master no less, chooses to kill one individual and maim another. When Dr. Evazan and Ponda Baba become enraged and attack Old Ben, why is Kenobi’s immediate reaction also a violent one? Surely a Jedi Master could disarm these two in a less confrontational manner, doing so without the need to call upon the Force in an obvious, attention grabbing way. Kenobi needn’t, for example, use the Force to throw the two across the room. Rather, using his finely tuned Force skills, Obi-Wan could have easily incapacitated the two, making them trip over their own two feet if he wanted. Kenobi holds his lightsaber after the brief fight with Evazan and Baba. But, that isn’t what happens. Instead, we are left with the absurd reality that Kenobi uses deadly force, inflicting pain and death without the slightest bit of remorse. And this is where things get tricky. Suggesting, for example, that Kenobi’s actions are of the Light Side of the Force would entirely undercut the fact that the Light Side does not lend itself to the destruction of life. At. All. So no, I absolutely do not think Kenobi is guided by the Light when he strikes down Evazan and wounds Baba. So where in the name of Malachor do we go from here? Honestly, I haven’t the slightest idea. The fact that Kenobi kills Evazan and maims Baba opens the door to a cacophony of thoughts and questions, the Light Side/Dark Side being just the tip of the iceberg. Thinking about the incident for some time, and now putting the thoughts into a post, I am pulled in numerous directions with no clear-cut end in site. Part of me wants to absolve Kenobi because he is one of my favorite characters, another wants to chastise him for not acting the way a Jedi Master should act, and yet another wants to throw papers into the air in frustration (maybe I will). In lieu of all of my hair going gray thinking about this, I want YOU to chime in. Let’s keep the conversation going in the comments and, as a team, think about Kenobi killing Evazan and maiming Baba. I’m curious to hear what others have to say about Kenobi’s actions during this short but violent incident in the Mos Eisley Cantina. While short, the scene in Revenge of the Sith is intensely powerful. Jedi younglings, hiding in the Jedi Council Chamber from attacking Clone Troopers, emerge from their concealment when a familiar figure enters the room: Anakin Skywalker. Unbeknownst to the young Jedi children, Skywalker is no longer the Knight they have all come to love and respect. Instead, he is Darth Vader, and he is the one leading the Clone Troopers in the attack against the Jedi Temple. As the younglings emerge, one young boy steps forward and in a calm but obviously scared voice asks, “Master Skywalker, there are too many of them, what are we going to do?” Immediately, the camera shot changes from the innocence of the boy’s face to the malice of Vader’s. Reacting with only the slow downward nod of his head, Vader stares at the child who has addressed him. The shot changes again and we now see the child in the center of the shot with other younglings to his sides and behind him. 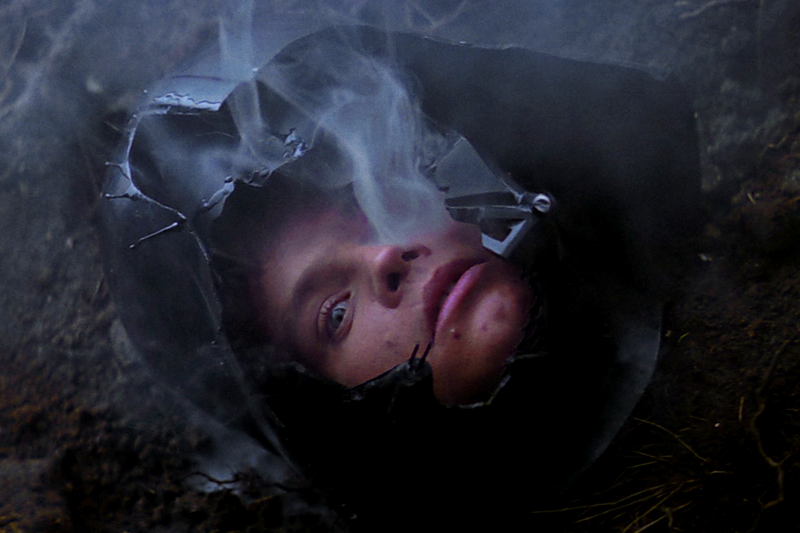 Vader’s body is cut off, and all that is visible of him is his left hand and the lightsaber he holds within it. His hand moving, Vader ignites the saber into a brilliant blue beam. At this, the child jolts, takes a step back, and the scene ends. A Sith Lord and a Jedi youngling. I can still remember sitting in the theater watching Revenge of the Sith the night it opened and being absolutely shocked by this scene. We all knew going into the film that Anakin Skywalker would fall to the Dark Side, that he would become Darth Vader. Hell, we even knew he would end up leading an attack on the Jedi, beginning the purge that would whip out the vast majority of the ancient Light Side order. 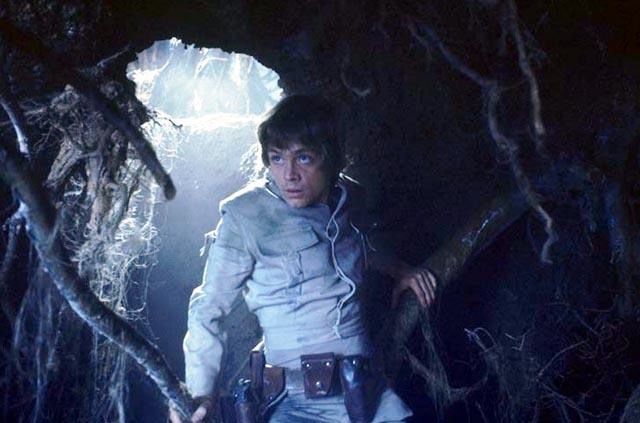 But what I wasn’t prepared for were these few seconds where young Jedi children, innocent, adorable, and hiding from the Temple attackers would come face-to-face with Vader. While it hurts to watch the systematic destruction of the Order as Jedi Generals are killed by their Clone Troopers, it was at least bearable since those Jedi were adults. Children though, that’s tough. We may not see Vader do the deed, but we all know, when the lightsaber is ignited, what’s about to happen. Our imaginations are strong enough to put the pieces together. The thing is – and I admit this is a weirdly absurd thing to say – he is fully justified in killing the younglings. I’m not suggesting I like that the younglings die, but within the context of the story that is Star Wars, their murder makes perfect sense. After all, the person we see enter the Council Chamber is not Anakin Skywalker but a newly minted Dark Lord of the Sith – Vader. Before attacking the Temple, Vader’s new Master, Darth Sidious, gave him strict instructions to “Do what must be done.” He told Vader “not to hesitate” and to “show no mercy” to the Jedi he would encounter. Is what happened to those children heinous and cruel? Of course, but why should a Sith care? Those children weren’t just any children, they were Jedi younglings. Their collective death is justified by virtue of their being members of the ancient, mortal enemy of the Sith. Should a Sith be blamed for acting like a Sith? I don’t think so. 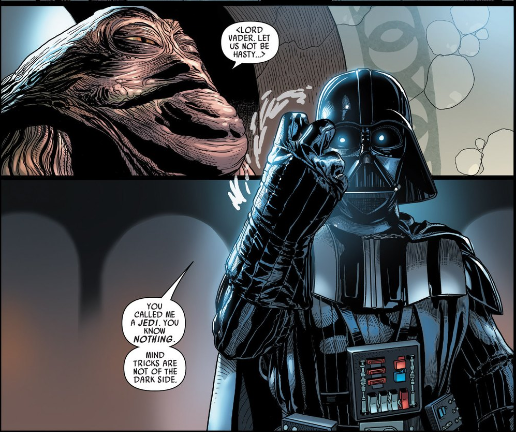 Besides, would we be as shocked if the Sith doing the killing wasn’t Vader? Say it was Darth Maul, or Darth Tyrannus, or even Darth Sidious – what then? They, too, would be justified in killing Jedi younglings, and we can easily imagine a scenario in which any one of these Sith Lords would kill any Jedi, young or old, if given the chance. But this scene needs Vader to make it work. The dramatic effect in the scene hinges on “Master Skywalker” being the would be savior of these children. Like I said above, the youngling who is speaking is unaware that Skywalker is no more, and the person standing before him is a Sith Lord. But WE are aware, and with this knowledge we’re trapped inside the room with those children, unable to escape from the reality of what Anakin-turned-Vader does to the younglings. Again, we don’t see him do the deed, thus we don’t know precisely how Vader goes about killing each child. Perhaps he cuts them all down with his blade or uses a Force choke on a few of them. Luckily, we are sparred from having to watch the dark deed but part of me wishes we had been forced to watch, if only to cement in our minds how twisted Anakin had become and how ruthless Darth Vader really is.